Staff photo by TOM KING Silver Knights starter Luke Dawson will take his 4-0 mark to Tuesday's FCBL All-Star Game at Holman Stadium. NASHUA – Seven Nashua Silver Knights have been selected to the seventh annual Futures Collegiate League All-Star Game, set for this Tuesday at Holman Stadium at 6:45 p.m. It will be an all-day festive event, celebrating the 80th birthday of Holman, and the teams have been divided up as road and home Nashua Dodger teams, wearing the uniform number 36 of former Dodgers Don Newcombe (gray uniformed road “Nashua”) and 39 for the late Roy Campanella (the white uniformed Dodgers, home team). As reported Friday, Silver Knight pitchers are on one team and position players on the other. Pitchers, on the road “Nashua” team are starters Luke Dawson , Brandon Dufault, and reliever Drew Farkas. Positon players on the Dodgers are first baseman/DH Jake Lebel, shortstop Cody Morissette, outfielder Jeff Costello, and first baseman Ryan Berardino. 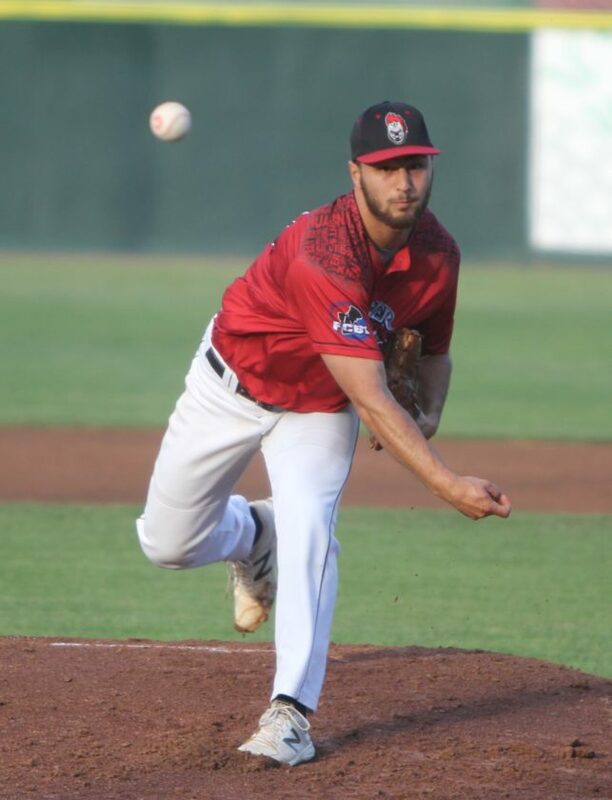 Dawson had likely his best performance in the second game of Thursday’s doubleheader vs. Martha’s Vineyard as he is now 4-0 with a 3.31 earned run average. Dufault, who at one point led the league in ERA, is 2-1, 1.55 while lefty reliever Farkas is 0-0, 2.91 with two saves. Lebel is hitting .382 with four homers and 22 RBIs and an OPS of 1.102, while Berardino is at .324 with nine doubles, a homer, and 12 RBIs. Morissette, one of five incoming freshmen on the Knights, is hitting .366 with a homer, 14 RBIs, an OPS of .960 and an on base percentage of .430. Costello, who has basically taken over left field, is hitting .315 with three homers, 11 RBIs and a .413 on base. Pitchers – Luke Dawson, Nashua; Brandon Dufault, Nashua; Drew Farkas, Nashua; Isaiya Mestre, Pittsfield; Henry Ennen, Worcester; Makenzie Stills, Worcester; Dakota Mcfadden, Worcester; Kendall Pomeroy, Worcester; Shayne Audet, North Shore; Richard Bereton, Bristol. Catchers – Jack Kelly, Brockton; Nick Raposo, Martha’s Vineyard; Mack Cheli, Worcester. Infielders – Eric Foggo, Martha’s Vineyard; Patrick Sullivan, Pittsfield; Ian Ostberg, Bristol; Zach Gelof, Brockton; Kellen Hathaway, Martha’s Vineyard; Ivan Nunez, Pittsfield; Charlie Maxwell, Brockton. Outfielders – Sal Frelick, North Shore; Matt Johnston, Brockton; Colin Shapiro, Martha’s Vineyard; Joe Lomuscio,Brockton; Michael Wynne, North Shore. Pitchers – Neal McDermott, Bristol; Emmet Sheehan, Bristol; Connor Hall, Martha’s Vineyard; Devon Dimascio, Martha’s Vineyard; Shawn Babineau, Martha’s Vineyard; Bryan Ketchie, Martha’s Vineyard; Chance Huff, Martha’s Vineyard; Jack Mahala, Brockton; Sam Jacobsak, Brockton; Danny Barlok, Worcester. CATCHERS – Patrick Winkel, Bristol; Brett Coffel, Worcester; Taylor Mileur, Pittsfield. INFIELDERS – Jake Lebel, Nashua; Ryan Berardino, Nashua; Cody Morissette, Nashua; Edward Haus, Worcester; Jackson Raper, Martha’s Vineyard; Chris Rinaldi, Worceser; Dustin Harris, Worcester. OUTFIELDERS: Jeff Costello, Nashua; Brian McHale, Pittsfield; Michael Delicarri, Worcester; Dylan Faircloth, Pittsfield; Matt Chamberlain, Martha’s Vineyard.